Unlike his contribution to the sic-fi genre, Star Wars, George Lucas’s contribution to fantasy, Willow, has been largely forgotten by the public. Very much a film of its time, Willow appeared in 1988 amid a buzz that may now be difficult to believe. Only five years had passed since the triumphant, money-spinning conclusion to the original Star Wars trilogy, the Indiana Jones saga was still going strong and it seemed that everything George Lucas touched (barring Howard the Duck) turned to gold. With the notable exception of The Princess Bride, fantasy films had until then seemed to be box-office poison and it was thought that Willow was the film that would change everything – with the aid of that old Lucas magic of course. Lucas had originally conceived the idea for Willow as long ago as 1972, initially as an alternative to adapting The Lord of the Rings for cinema, since he couldn’t, as a then unknown young film-maker, manage to obtain the rights for Tolkien’s magnum opus. The similarity between the two stories is unmistakable, both in terms of the mythical fantasy world in which Willow is set and, in particular, its eponymous hobbit-like hero, the Nelwyn Willow Ufgood (who was played, incidentally, by Warwick Davis, the same actor who starred as one of the furry Ewoks in Return of the Jedi). Unfortunately, the comparison to Tolkien’s work did nothing to help Lucas’s film, which was only a modest commercial success and drew many critical reviews – a number of which came from the audience of fantasy fans at which it had been mainly aimed (foreshadowing the even worse critical response that The Phantom Menace would receive from Star Wars fans a decade later). Willow might have faded into oblivion entirely were it not for two things – ILM’s visual effects sequences, which led to a revolutionary breakthrough with the digital morphing technology that would later appear in films such as Terminator 2: Judgement Day; and the continuation of Willow Ufgood’s story in the novels which make up the Chronicles of the Shadow War. The question that you might, quite rightly, be asking at this stage is, why on earth should I care about a series of books based on a film that was a bit of a box-office flop? On the face of it Willow is an uncomplicated, self-contained film that doesn’t particularly seem to invite a sequel. The tyrannical reign of the Demon Witch Queen Bavmorda is brought to an end with the aid of a prophecy that foretells her doom as the result of the birth of a child, Elora Danan. Battles are fought, foes are vanquished and, after all these great deeds are done, the heroes all return to their lives, happily ever after, the end etc. Whilst there is plenty for children to enjoy in the film, at first glance there is not much to appeal to the more sophisticated fan of fantasy – no shades of grey, little character development and no truly original or interesting ideas. It is therefore something of a shock when (*SPOILER ALERT*) within the first thirty pages of the first of the Shadow War novels, half of the cast of the film are killed off brutally. It is an early sign that the world of the Shadow War Chronicles is infinitely darker and more uncertain than the simple heroics of the feature film. The books are written by George Lucas and Chris Claremont, two writers who, though phenomenally successful with their Star Wars and X-Men franchises respectively, are not particularly well known for writing novels. However, it is extremely telling that Lucas and Claremont chose to continue Willow Ufgood’s adventures in print rather than in comics, animated adventures, further films or any number of other media. This is a franchise that Lucas in particular wanted taken as seriously as Lord of the Rings – he once specifically likened the original Willow to The Hobbit and The Shadow War Chronicles to Tolkien’s epic sequel. Also, the fact that Lucas genuinely seems to have wanted this series to succeed on its merits as a set of novels in its own right seems to be demonstrated by the fact that, when they were first published, there was no overt indication of any tie-in to the film Willow. So how successful was Lucas? Considering that its two authors are best known for films and comic books, Shadow Moon and its two sequels are actually very well written. There are many similarities between the Shadow War novels and the other landmark fantasy series of the nineties, like The Wheel of Time, A Song of Ice and Fire and the Farseer trilogy. The language is occasionally ornate and overly descriptive but more often down to earth, the pace can sometimes be slow (coming alive spectacularly in the action sequences) and the depictions of death and violence are unstinting in their gory detail. Above all else though – as you would expect from the writer of X-Men – it is the characters and their interactions which really shine through. To some extent Claremont and Lucas are aided by the fact that anyone who liked Willow the film will be invested in the character’s further adventures from the get-go. Added to this, perhaps in homage to Tolkien, the authors exploit the device of having a small person as the readers’ window into a large and infinitely dangerous world. This keeps the action and the heroes’ adventures, as fantastical as they may get sometimes, grounded and above all ensures that the series has a heart. The books also benefit from the fact that they were written just before it seemingly became essential for all fantasy novels to have a cast of thousands of viewpoint characters. Instead, this is very much Willow’s continuing story and as such the reader is spared from having a new viewpoint character every other chapter, something that I find tends to leave readers feeling bewildered and above all uninvested in the story and the characters. The effort which Lucas and Claremont put into the books really seems to have paid off if you ever look at their ratings on Amazon – all three have an average of four to five stars, and that from an awful lot of reviewers! Since the conclusion of the Shadow War Chronicles, Willow has continued to have a life beyond the 1988 film. 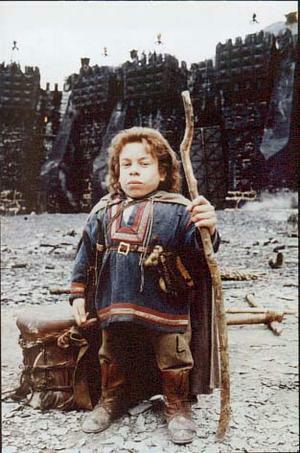 The film and its reputed commercial failure (in fact, when you take into account the TV, video and DVD sales, Willow was anything but a flop financially) is widely referenced in the 2011 BBC Two TV comedy, Life’s Too Short, which also stars Warwick Davis. Both Lucas and Davis commented in April 2005 that a television series acting as a sequel was under consideration. In June 2008, Davis reiterated his hopes to return for a theatrically released second installment of Willow – he also mentioned on his Twitter account in November 2009 that he would be interested in doing a sequel. Until that happens, I’d encourage any fan of the film to seek out the Shadow War Chronicles – you may be treated to a pleasant surprise! I’ll have to check those out – I love Claremont’s early X-men arcs (now if only Lucas had got someone similar to help him with the Star Wars prequels). And I agree with you on the “thousand viewpoint” malarchy. Some books I’ve read are about a foot thick, and the story hardly progresses at all because you have to hack through so many different people’s experiences of it (*ahem* wheel of time book 10). I’d never even heard of “Willow” before. It sounds quite interesting! Thank you, thank you for singing the praises of “Willow.” I love “Willow.” It’s one of my top 5 fantasy film picks! The story is good. The actors and supporting cast are superb. It has the right mix of comedic and seriousness. It has wisdom. It has also decent fundamental values of honor, love, compassion, virtue, etc. It contains also one of Val Kilmer’s best performances. He’s totally immersed in his character. Honestly, while Leprechaun is all in good jest. I want Warwick to be remembered for “Willow” instead. Warwick deserves more roles not because of his stature but because of his excellent acting abilities. Grace, you should see it. Yes, it’s not going to be glitzy like films are today with their insane budgets and cgi. It’s a picture with beautiful scenery, landscapes, terrific wardrobing, interesting characters, and a good firm plot. It’s got comedy, drama, and action. It’s got everything a fantasy should include, including magic, proper villains, and monsters. I LOVE Willow! I never knew about these books. Claremont’s X-men are some of my favorite. I have my reservations about Lucas’ writing ability but I will definitely check it out. Thank you. I always thought the people who didn’t like Willow had no imagination what so ever. I, personally loved it, but I never knew about the books which followed up the story. It seemed not quite finished to me back then, and now. Thank you for showing me these books. They’ll soon be a part of my library. I’m going to repeat what several others said. I love Willow and had no idea that there were books based on it. Wow. Cool. I’ve just added all three to my to-read list. Thanks for writing this! Another echo–I really enjoyed Willow, didn’t know about the books. But I will share that one of my favorite all time lines comes from this movie. When Sorsha says to Mad Martigan, Went Away? “I dwell in darkness without you” and it went away? I could not stop laughing. Im getting a small issue. I cant get my reader to pick-up your feed, Im using bing reader by the way. Mmm… I’m not too sure what you can do about that – perhaps contact bing or try to sign up by clicking the “Follow Blog Via E-mail” link in the sidebar? I loved the Willow movie, read the book that the school book club had, read the other “Shadow” books. The twist at the end of the books take us all the way back to Willow. Still a good read today with it’s many twists and turns.